In an increasingly frightening world home should be the one place where everyone feels safe. It should be a secure place where our family and belongings are safe and the outside world is … outside. Nothing is more terrifying than the thought of this sanctuary being violated - but sadly this is becoming an increasingly regular occurrence. Burglaries are so common that they hardly merit any mention and the media revels in stories of innocent householders being assaulted - or worse - in their own homes. It is easy in this climate to feel utterly helpless but householders can, and should, do a lot to protect themselves and their homes. What would a Burglar Do? Most home burglaries are carried out by opportunists who spot an easy target and decide to break in. The police advise people to look at their homes from the perspective of a burglar. Householders should aim to identify weak spots and then get rid of them. For example: how would a householder get in if they locked themselves out? If there is a way to get in it is highly likely that a burglar will notice it. Householders should take particular care to make sure that all walls and doors - including side gates and garage doors - are well-built and securely locked. They should also look out for anything that could be used as a climbing tool - like low-hanging branches. The property should be well-lit and as free as possible of accessible hiding places. All doors and windows must be kept locked shut. Keys should be hidden away - not left within reach of a door or window. 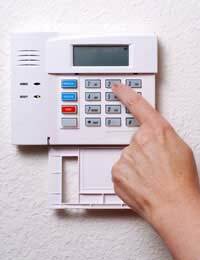 A visible burglar alarm should be fitted - and switched on. Walls around the property should be robust and about 6ft/2m high. Gates to side entrances should also be robust and firmly locked. The front door should be visible from the street and not obscured by a wall or any shrubbery. Any tools or ladders, which a burglar could use to break in, should be firmly locked away. Wheelie bins can provide a convenient boost to an open first-floor window. If the household has just invested in a brand new, top of the range plasma television the packaging should not be left outside waiting for the recycling collection - this is an advertisement to burglars that the house is worth breaking into. A spare key should never be kept under the front door mat or a flower pot. Newspapers, milk bottles or mail should not be allowed to build up at the property. Any regular deliveries should be cancelled. The Post Office offers a "Keepsafe" service whereby all mail to a particular address can be held at the sorting office while the occupants are away. If a trusted neighbour has a spare key to the property they could go in regularly: lights should be turned on and off; curtains should be opened and shut; any deliveries left outside can be brought inside and anything put through the letter box can be picked up. Neighbours could be asked to park on the drive. Timers can be installed to lights so that they are switched on and off randomly to make it look as if there are people in the house. Similar timers can also be fitted to radios or televisions. Any garden foliage should be kept neat - an overgrown garden makes a property look unoccupied and provides a handy hiding place for burglars. Householders should not leave a message on their answer machine which tells callers that they have gone away. Most burglars just want an easy life: to get in and out of a property as quickly as possible with some nice, high value items in their bag. By putting up a few obstacles and by not advertising that a house is empty, householders may be able to avoid ending up as a burglary statistic.